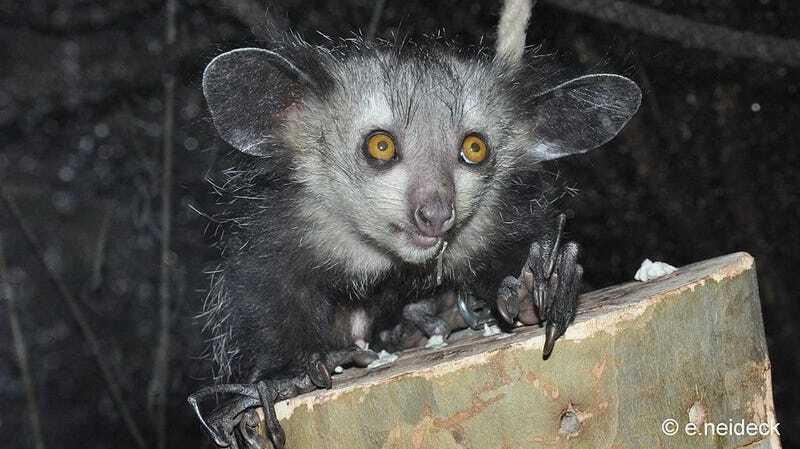 The aye-aye is about as ridiculous looking as a primate can get: beady yellow eyes, bat-like ears, and hands like horrible spiders. But perhaps its most interesting feature is its teeth. Over millions of years, species on Earth have developed seemingly unique adaptations that help them survive in challenging environments. But sometimes, totally different species that face similar pressures end up independently evolving the same features, a process known as convergent evolution. That’s how a lemur-like primate ended up with squirrel teeth, according to a new study. “The aye-aye is a really unusual primate,” study author Phillip Cox from the University of York told Gizmodo. “It lives in Madagascar with other lemurs, it lives in trees like lemurs.” But it has an unusual diet, eating grubs it finds in holes beneath the tree bark it gnaws off with its front teeth. That could be how it ended up looking so squirrelly. The researchers compiled microCT scans of 46 mammal species, including aye-ayes and squirrels, either from the Morphosource online database or from specimens in museums. They put them into a computer program that could run a statistical analysis and compare the shapes of the aye-aye skulls to those of squirrels. They found that the the two species’ skulls had more in common than would be expected by randomness alone, according to the paper recently published in Biology Letters. Those similarities existed in the shape of the animals’ skulls. Both squirrels and aye-ayes have continually growing, long front teeth. The aye-ayes also have relatively longer snouts compared to other primates, and brain cases similar in shape to squirrels’. The researchers thought the similarities could best be explained by the aye-aye’s need to impart lots of force on its teeth. The aye-aye scrapes bark off of trees in order to eat out the bugs, while squirrels crack nuts. That’s how convergent evolution works—similar evolutionary pressures could lead to unrelated but similar-looking animals. But this is just a best guess based on modeling, as we can’t know for certain why these traits evolved. Correction: This article said the researchers analyzed 46 aye-aye species, when actually they analyzed 46 species of mammals. It’s been corrected in the text and the writer regrets the error.